ALL THE TIME GOD IS GOOD! : Do we need Old Covenant Law to balance New Covenant Grace? Do we need Old Covenant Law to balance New Covenant Grace? I've begun a study concerning this question about the New Covenant Church and its relationship with the Old Covenant Law. In the first study I stated unequivocally that the Church is not under the Law in any way. In this study I want to address further this issue of "balancing" grace with Law. Whenever a truth from the Spirit is being restored to the Body of Christ many voices arise in opposition. Usually this opposition arises from adherents to a previous renewal of truth that don't want their "truth" to be disturbed by some "new truth". Some Leaders are fearful the new truth will cause their control and dominance to lose its grip. Others are fearful some will abuse the truth. First, we must understand all the truths God has restored over the last hundred or so years to the Church are not contrary to one another. The power of a Spirit filled life, healing, the gifts of the Spirit and faith aren't opposed to each other. So now the renewal of the truth of God's amazing grace isn't opposed to any of these other truths. Grace helps us advance further in Christ. His divine favor and influence makes it even easier to receive all God has for us. The reality is when God is restoring His truth to the Church we should add that truth with other truths to get the full picture. None of God's truth cancels out other truths. For example, grace and healing flow together they don't oppose one another. Lets use the message of faith to further illustrate. When God restored the truth of faith to the Church many opposed it. Why? Because those still operating in the Charismatic truth believed only God could initiate healing or blessings. Others exalted sovereignty over all other truths and rejected the message. With faith, God revealed you didn't need some powerful and anointed service to receive from God. Because He is sovereign, that is the supreme ruler, He meant what He said in His Word. You could open your Bible and take God at His Word anytime and in any situation. That really is all faith truth is. It is taking God at His Word. This is where the true definition of balance comes in. Over the years in faith circles, the truth of faith has morphed into a serious works and efforts theology. Some fell by the wayside only hearing a concept of faith and quit their jobs and stopped medical treatment. Still others, persevered with endless confessions, and works to prove their faith was genuine. If they hadn't received they hadn't worked hard enough. I have actually heard this taught. So what is balance? 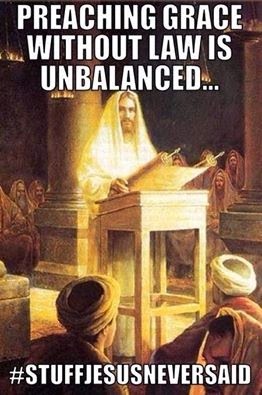 Balance is simply staying within the truth of the Word of God. Does the Word of God advocate not working or ceasing medical care? Not one place suggests this. Does, the Word declare it is by our great effort we receive from our Father? Not one place, He said it is by grace, through faith and not of ourselves. Staying with the Bible and proper context and exegesis is all balance is. Does the Law then balance grace? Does God's Word teach this? According to these passages the Old Covenant was done away so we can have the New. These also inform us that we are to teach the New Covenant not the Old. It also offers a stern warning for trying to add to grace or mix the law and grace. If the Word declared that we are to be ministers of the New Covenant why would we use the Old to "balance" the New? The Old was fulfilled in Christ. In Ephesians 2 Paul clarifies this issue clearly. Look at this passage. The Gentile nations were strangers and far off from the Covenants. This includes the Abrahamic Covenant and the Mosaic Covenant (Law). The other Nations of the World were never given the Mosaic Law. Why then would gentile Christians be susceptible to the Law? A good illustration would be America and Singapore. How would you like to be resting at home and Law enforcement suddenly raid your home? The reason for the abrupt intrusion? You were found breaking Singaporean law. How can this be? I am an American how am I under the requirements of the laws of Singapore? The same way we aren't under some other nations laws we as the Church were never given the Mosaic Law and therefore not under any requirement to abide by it. The Word is clear. Through the Cross and the Blood of Jesus He abolished that Old Law and established a New Covenant. He has replaced the Old Law with the New Covenant Law. That is the Law of love and faith and the Spirit of life in Christ Jesus. If being right with God depends on how we keep the Law then we nullify grace. Why? Because by default you're thinking and actions are saying that you are choosing your performance over Christ's perfect performance. Do we mix the Law with grace? Do we balance grace with Law? Absolutely not! The Word of God is clear. To add Law to your relationship with God is to nullify grace. Want to see grace balanced? Stay with the Word. Does the Word teach grace gives us a license to live in sinful activity? According to Titus 2, no it doesn't. Does grace make us lazy? 1 Corinthians 15 says no. That answer's those who see grace as folly. What about those who strive to keep the Law? According to all the passages I have listed the Old Covenant has been abolished. The New Covenant has taken its place. Staying with the Word of God reveals that mixing grace with Law nullifies grace. Trying to balance grace with Old Covenant Law brings it to nought. Law is about your performance. Grace is about His perfect performance. Where will you place your trust and hope in?